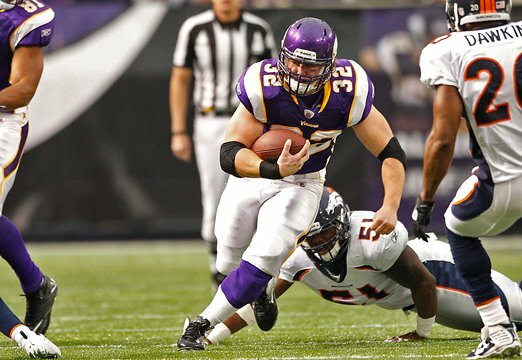 Toby Gerhart: Gerhart followed a forgettable performance against Atlanta with an impressive one last Sunday. He got better blocking against the Broncos and it seems like more downhill play calls. Gerhart is a far better player running north and south than he is when the play moves laterally, such as on a sweep. When he can build up a head of steam and hit the hole hard, he can do some damage like we saw when he ran over a Broncos linebacker. As the announcer pointed out, he seems he’s at his best when he’s got a lead blocker in front of him as well, so he can get to that second level. Once there, he’s almost always good for 8-12 yards. But it seems like that’s the best way to use him. When there’s congestion at the line, such as in short yardage situations, he doesn’t do so well because he’s hasn’t got a full head of steam, he’s got to pick through defenders to find a hole, he has trouble getting low to the ground, and he hasn’t got much of a jump cut to bounce a run outside. Put him out in space, one-on-one with a cornerback, and he almost always goes down. And he’s like a battleship when he’s got his back to the defense like when he’s catching a dump-off pass; he takes forever to turn it upfield. Finally, his pass protection is iffy; he’ll miss blocks he should make and fail to identify blitzes. He’s young, so he’s still got a lot of learning to do and should improve and he’s certainly got skills that can be exploited but if he’s a starting-quality running back, then he’s going to need a superb offensive line blocking for him because defenses will know what to expect with him. All that said, I’m glad he’s Adrian Peterson‘s backup because he’ll continue to punish defenses when our star needs a spell. Percy Harvin: The guy just continues to do it all, doesn’t he? You stop and think about it, and it’s absolutely remarkable that the guy can be that good on that little practice with a rookie quarterback. It’s not like the Broncos didn’t know, first and foremost, that they needed to shut Harvin down. And yet he still catches eight balls for 156 yards and two touchdowns. Ryan D’Imperio: As you know, I’ve been a big fan of D’Imperio from the start but that was largely because I was such a vehement anti-fan of his predecessor, Naufahu Tahi. Happily, the converted linebacker is turning into a decent fullback. He doesn’t just bounce off defenders as a lead blocker the way Tahi used to, he seems to be able to sustain his blocks, and did you see that beautiful chip he put on Champ Bailey on Harvin’s touchdown? Kyle Rudolph: The rookie made an absolutely amazing catch [WATCH] that is the type of play you expect from a receiver like Randy Moss, not a tight end. He was on his way to a touchdown on the ball Christian Ponder placed perfectly for him to run under in the front corner of the end zone and as a result drew a pass interference penalty. What little we’ve seen of Rudolph this year demonstrates he’s got amazing hands and, once he’s able to block and run routes a little better, he’s going to be a pretty devastating weapon. I’d expect Rudolph to have a break-out year in 2012. The Vikings also have rookie Allen Reisner–another tall, fluid tight end with good hands–on the roster and they recently re-signed Mickey Shuler (6’4″, 251 lbs), another tight end they clearly like but who slipped away from them last year. Given that the Vikings obviously need to rebuild and given the youth at the position, I’d really be surprised to see Visanthe Shiancoe back next year and I wonder if this might be Jimmy Kleinsasser‘s last year as well. As much as I love the Shankopotomous and what he’s capable of, on average, he’s also typically good for at least one dropped pass, one penalty, and one missed block a game. I think the Vikings offensive line needs some help but I don’t know exactly how much help it needs. I wonder how far a top-five left tackle draft pick would go toward vastly improving the play of the whole line. If the Vikings are at number two or three, I don’t see how they can pass on USC’s Matt Kalil. The other glaringly missing piece to the offensive puzzle is a legitimate deep-threat wideout. Imagine how deadly Percy Harvin would be if defenses needed to respect the long ball? But, you know, I really don’t think the offense is that far away from being explosive. It’s the defense we need to work on.